Growing evidence suggests that the unique molecular engines that drive photosynthesis arose only once during Earth's history. All the diverse reaction centers—packets of proteins and pigments—in plants, algae, and certain bacteria appear to have evolved from a single ancestral structure. Researchers compared the most recently available structures. They developed new hypotheses that explain reaction center evolution in terms of selective pressures. These hypotheses describe a potential route of evolution for the great variety of photosynthetic reaction centers seen today. Knowing how reaction centers evolved can offer insights into how plants use solar energy with extraordinary efficiency to produce energy-rich chemicals. Why study the details of this critical part in photosynthesis—the reaction center? Such studies may help reveal the chemistry and chemical mechanisms that can inform new strategies for using solar energy to produce fuels and other chemicals on an industrial scale. All available evidence supports the hypothesis that the reaction center, the pigment-protein complex that uses light to produce chemicals that photosynthetic organisms need, arose once in Earth's history, over 3 billion years ago. The basic architecture of that first reaction center has evolved into a great diversity of reaction centers. 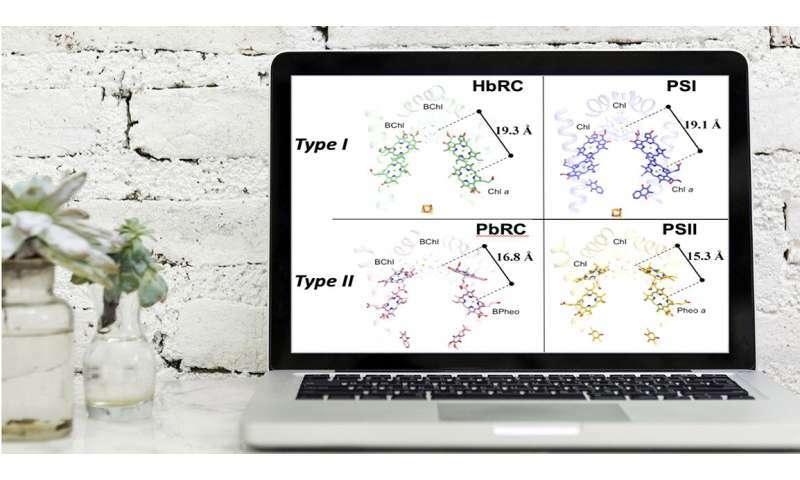 The research team compared the detailed crystal structure and function of a primitive reaction center, believed to be a close relative to the ancestral reaction center, to all known reaction center types for which similar structural data are available. The comparisons let them generate hypotheses about structural and functional aspects of the common ancestors of all reaction centers. In the evolutionary scenario proposed, the ancestral reaction center was made of two identical proteins and loosely bound two mobile quinones that can accept electrons. This ancestral reaction center was inefficient at handing off electrons to the quinones. The two types of reaction centers now known evolved to resolve this inefficiency. Type I centers, which now support metabolism by moving electrons to soluble proteins, added an iron-sulfur cluster. Type II centers restructured their cores to affix the quinone in a way that allowed more efficient electron transfers. The need to adapt to the growing levels of oxygen in the air drove later changes in Type I reaction centers. In a companion study, the team found that heliobacterial reaction centers preferentially offer electrons to different acceptors depending on the amount of light available. These studies suggest how reaction centers may have changed and offer insights into the reaction center diversity observed today.